For courses in Actuarial Mathematics, Introduction to Insurance, and Personal/Business Finance. This text presents the basic core of information needed to understand the impact of interest rates on the world of investments, real estate, corporate planning, insurance, and securities transactions. 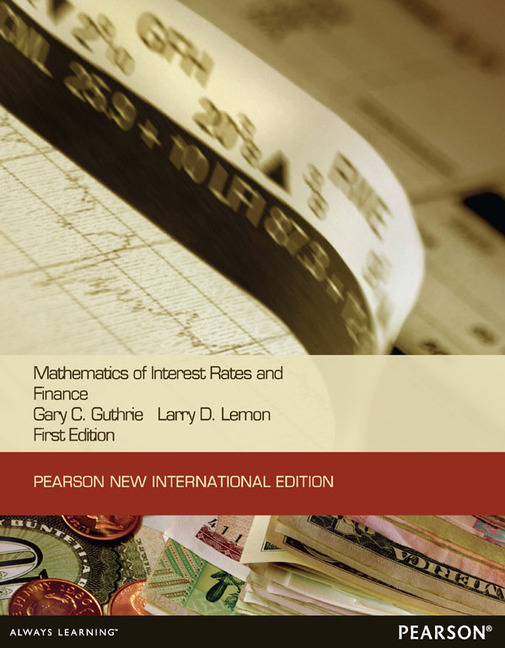 The authors presuppose a working knowledge of basic algebra, arithmetic, and percents for the core of the book: their goal is for students to understand well those few underlying principles that play out in nearly every finance and interest problem. There are several sections that utilize calculus and one chapter that requires statistics. Using time line diagrams as important tools in analyzing money and interest exercises, the text contains a great deal of practical financial applications of interest theory as well as its foundational definitions and theorems. It relies on the use of calculator and computer technology instead of tables; this approach frees students to understand challenging topics without wilting under labor-intensive details. 7. Investing in Stocks and Bonds. 8. Depreciation and Capital Budgeting. 9. Advanced Topics in Annuities. Appendix A: References and End Notes. Appendix B: Using Financial Calculators and Spreadsheets. Appendix D: Answers to Odd-Numbered Exercises. Serial Table: The Number of Each Day of the Year. Calculator and computer technology—Relies on the use of financial calculators and spreadsheets rather than tables. Frees students to enjoy challenging topics without getting bogged down in labor-intensive details. Extensive use of time line diagrams—Provides these important tools for analyzing the money and interest exercises: a good time line often makes the needed steps and choice of a formula jump right out of the given information. Gives students the opportunity to use the time lines to organize and visualize the exercises presented. The student learn to recognize various word problem scenarios including the clue words that enable them to understand present value/future value issues. Practical financial applications of interest theory. Provides students with a variety of exercises and examples that are realistic, and will help them with personal financial matters and investments as well as in their professional careers. Simple, comprehensive organization—Starts with the basics and slowly builds up to the more difficult concepts. Enables students to become competent problem-solvers, as they will easily succeed in understanding the text and the concepts presented. The Fence Post Principle —Is a pedagogical tool to help students determine the number of payments for an annuity. Gives students an understanding of the relation between date arithmetic and payments, as well as other counting scenarios. The Golden Rule of Finance —Emphasizes that monies cannot be added or reconciled unless they are valued at the same point in time. Enables students to understand where on the time line the money should be, simplifying the concept so that they can pick the right mathematical tool to get there. Flexible text—Can be adapted for use at several levels. Enables instructors to utilize the text for basic-level (finance), intermediate-level (finance and theory of interest), and advanced-level (finance, theory of interest, and stochastic methods) students. Shows students how the exercises are worked, not just a numerical answer. Helps students get up to speed quickly as they proceed through the text. Available answer key for instructors—Contains expanded exercises for the even-numbered exercises in the text. The solutions manual also includes sample tests. Aids instructors in forming their curriculum.